The appeal, however, will not be restricted to ministers or preachers. The various volumes will meet the needs of laymen and Sabbath-school teachers who are interested in a scholarly but also practical exposition of Bible history and doctrine. 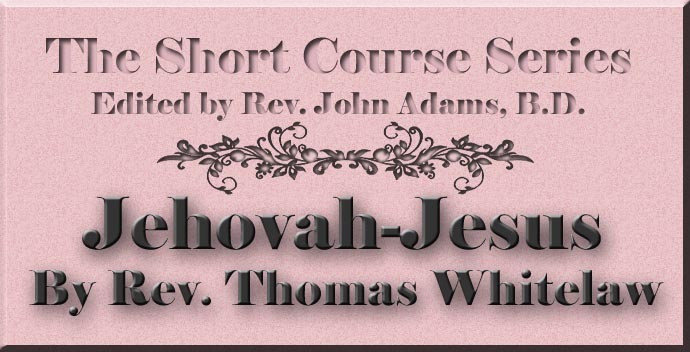 In the hands of office-bearers and mission-workers the "Short Course Series" may easily become one of the most convenient and valuable of Bible helps. "To what purpose should so many epithets be heaped upon God the Father in this place (Is. ix. 6) when the prophet's design is to adorn Christ with so many remarkable notes that might build up our faith in Him? Wherefore it is not doubtful that He is called the Almighty God (Deus fortis) for the same reason for which a little before He was called Immanuel." "A FACT SO peculiarly unique as the Incarnation of the Son of God in the person of Jesus of Nazareth might and must very fitly be prepared for, shadowed forth, indicated by preceding, more fleeting and mysterious, phenomena."